Okay. You asked for it. Click pictures to see larger. 5 peices of foam core board. (about $1.50/sheet at Walmart). White or light colored tape (I used white duct tape). 2 lamps, just about anything will work, with bright WHITE light bulbs. These can be light you have around the house. Step 1. Get someone to help you hold the foam core and using tape, tape the OUTSIDE of the box together. Duct tape works great for this. You will notice that the two side pieces are sticking out from teh rest of the box. I scored these (box cutter lightly over it) to use them as flaps on the front. You can cut them off if you want. I thought it would be more surface to bounce light off of so I kept them. Step 2. Use some tape to put up the poster board against the back. This give you a seamless white background. Posterboard comes in a variety of colors so you have lots of options in backgroud colors. Step 3. Light up your box with whatever lamps you have around (with WHITE bulbs) or purchase a couple table lamps (the ones with the moveable arms would be best). Place them int he box pointing up or against the sides. This will flood light into the box. If you point the light directly at the object you may get glare. Play around with this. After changing the lights, trying now flash and with flash you'll find the setup you like the best. Happy shooting! Below is a picture of 2 binderclips that I took in my lighbox. Click to see larger. Please let me know if this tutorial works for you and if you have any other questions. :) I hope this helped. That looks pretty simple. I may have to give it a try. TFS! That is really neat. I'm goint to give it a try. Thanks for sharing. I like how my clips come out. They look like they are just floating in nothing. :D It's fun to play with. I imagine if you have a msaller space nad you plan on photographing smaller thing syou could buy less sheets and cut them in half to make a small light box with one light. Probably perfect for most crafts. I can't wait to make a cake and put it in the box! Awesome tutorial...will give it a try! Thanks so much for the info!!! Do you hand hold the camera or use a tripod? Thanks so much. I have my project for my honey do list for the weekend. (I am sure my honey hubby thanks you too ;o). What a great idea and tutorial! Elizabeth, I love You! You have allways made things up, your so creative! Thanks for the instructions. I will have to make one. For what, I don't know, LOL!! "Do you hand hold the camera or use a tripod?" It depends on what I"m photographing and how I'm feeling. I'm usually pretty darn good at holding still. I use my tripod if my shots are coming out blurry. What an awesome result and I'll bet every bit as good as the super expensive ones. I can't wait to see how the pics come out with this. Very cool, and thanks for sharing the instructions. You rock as usual!!! Thanks for this!!!! I love your light box! I may have to try and make one for myself. Ty for the tutorial! Great light box, thanks for sharing the instructions. This is a great tutorial! I may have to make one for myself and set it up in my spare room so I don't have to figure out a way to put it up, take it down, put it up..... Thanks for sharing! You are so clever Elizabeth! 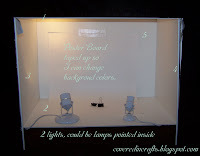 I showed this idea to my husband and we may try it to get rid of the shadows in my pictures! Great Tutorial! THANK YOU! Making one of these suckers is on my to-do list for 2009. This is awesome! I am going to ask DH to make one for me! Thanks for the instructions. I've tried making one before, a slightly different way, and I still get terible results. I have a feeling it's my lighting. Maybe the foam core would work better for me. This is just what I needed - maybe now my photos will look like all the cool kids photos! TFS! I really need to make myself one. Thanks so much for the advice regarding pointing the lights into the box rather than the object. I had made a light box but still couldn't get enough light around my cards! I've been looking for a good cheap lightbox tutorial. I'll tell ya how this goes for me (I don't know why it didn't occur to me to use foam core. I'm an art student, I practically breathe foam core).